Panasonic has launched the first commercial deployment of the HbbTV Operator App, allowing viewers in Germany to access the HD+ platform direct through their TV. The HbbTV OpApp specification lets users access the full HD+ bouquet of live and on-demand TV on any 2019 Panasonic OLED UHD smart TV sold in Germany. 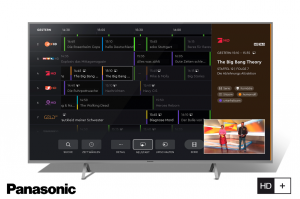 HD+ channels and interactive services can be accessed through an HD+ branded user interface on the Panasonic TVs without the need for additional hardware or smartcards. HbbTV Association chair, Vincent Grivet, said that the launch is the perfect illustration of what the OpApp is supposed to do: “enable an operator-specific user experience on a TV set without the need for additional hardware”. “We are confident that many more broadcast platforms will realise how powerful this is and will soon also adopt this approach, leading more TV manufacturers to ship OpApp-compliant TV sets,” he said. Panasonic’s managing director for Germany, Austria, Switzerland and the Netherlands, Kai Hillebrandt, said: “As the leading company in the area of TV receiver technologies, Panasonic is convinced that the HbbTV OpApp will be an essential element of future devices. HbbTV, or the hybrid broadcast broadband TV, is a global initiative aimed at harmonising the broadcast and broadband delivery of entertainment services to consumers through connected TVs, set-top boxes and multiscreen devices.